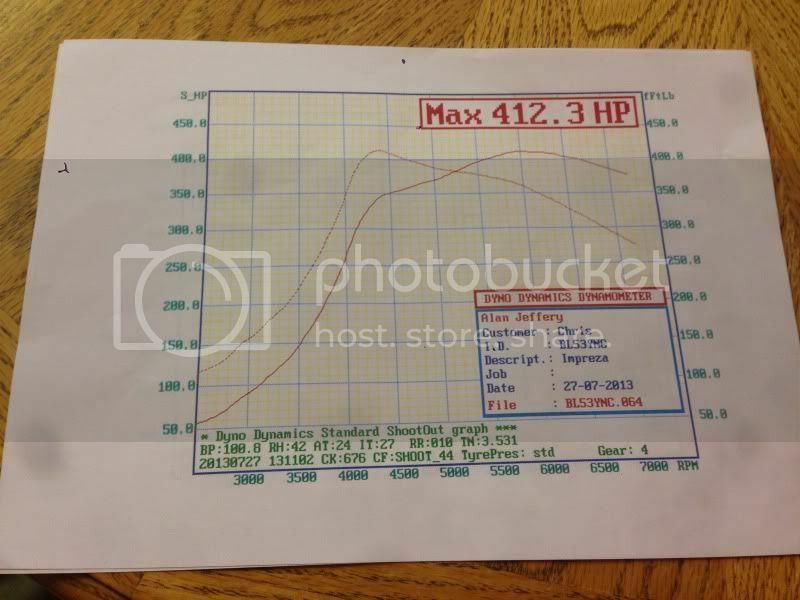 well after getting 352/360 out of my ported vf35 on my Newage Sti about 3 months ago, I'm now off there again tomorrow armed with a ported vf43 to see Martyn for a remap and a switchable meth map to see what we can achieve. Cannot wait to get stuck into the dyno and Martyn to work his magic!! Last edited by Blocks85; 27 July 2013 at 06:43 PM. 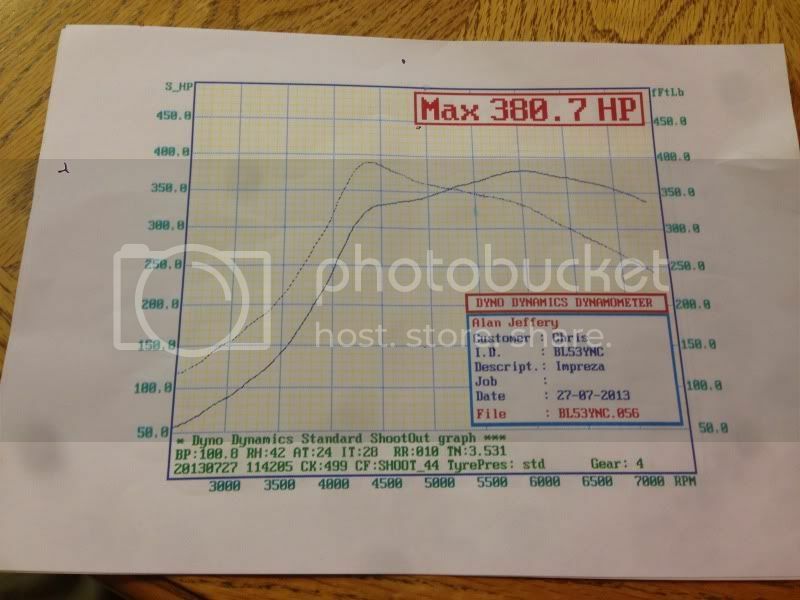 To give an idea, had a remap of my standard ppp blob Sti at Christmas and made 317-310 @ 1.5bar. Then ported the turbo with forge actuator set to 1 bar base pressure, 3 port subaru boost solenoid, port matched Japspeed headers/decat, RAMAIR induction kit, silicone intake pipe, forge big port dump valve, thermal inlet spacers, eBay front mount intercooler. Then remapped in march( I think) to 352/360 @1.3bar. Bit off topic but why do people still say there car is PPP when they have changed the exhaust and its been remapped. Wasn't the PPP just an exhaust and map? Excuse my ignorance if am wrong about it. And there is a lot more done with the package. Yeah your right bud, I meant when I took it down it was in the state of a standards Sti with the ppp kit so 300hp ish. I have wondered the same thing dude and that sums it up! Mines a PPP and I've wondered about the fuel pump gains and exhaust too. What figures you expecting/hoping for? The results are epic to say the least. Evening all, well I have the results from today at ENGINETUNER with Martyn j. Big thanks to everyone that helped me with the car! Car done absolutely awesome especially for a vf43 turbo. Here is the graphs. Did see over 390 on v power but Martyn said its too lean so safely richened it up and made 380. Is this a WRX or a STI? What boost did he set for both fuels? Blob Sti bud, complete standard engine apart from supporting mods. Meth is 1.7 holds 1.5/4 ish. Cheers nice results! Don't think that turbo would suit my wrx. 412bhp on a VF43!! Thats some good power!!! But if the VF43 is getting that sort of power and still drives like my car does now, I might look into keeping it!!! Cheers for the kind words lads, a lot of fettling and optimising the setup as a whole with all the mods as resulted in that working well and producing good results. I have got a ported vf35 that I've took off my car that would suit your wrx perfectly. That was running 352hp 360 torque before I replaced it with the vf43. How much for the Vf35? I have a vf35 on it already but the seals are going, it's smoking pretty badly. I'm after £350 posted for it bud, been fully ported to stop boost creep etc. my number is 07786520372 if your interested. 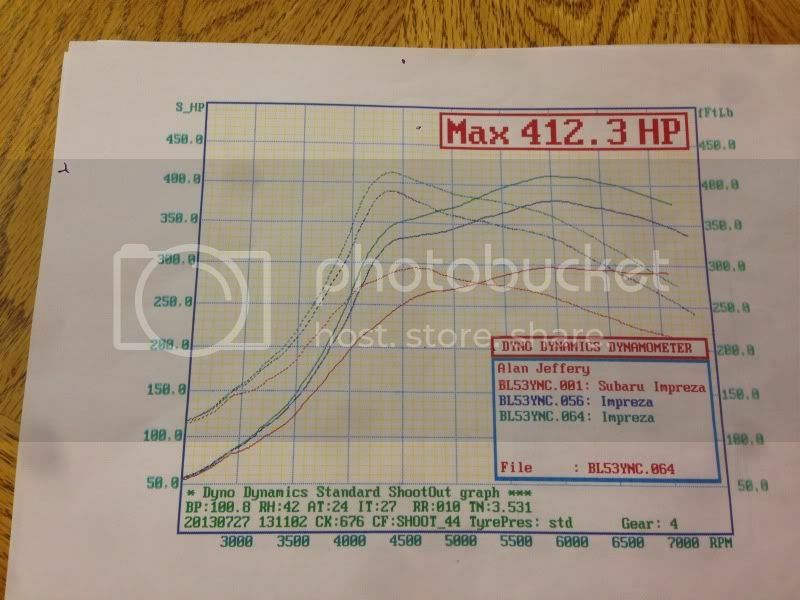 Not bad for a stock fit 2007 Sti hawke turbo. Many thanks for the business, and loving your enthusiasm! 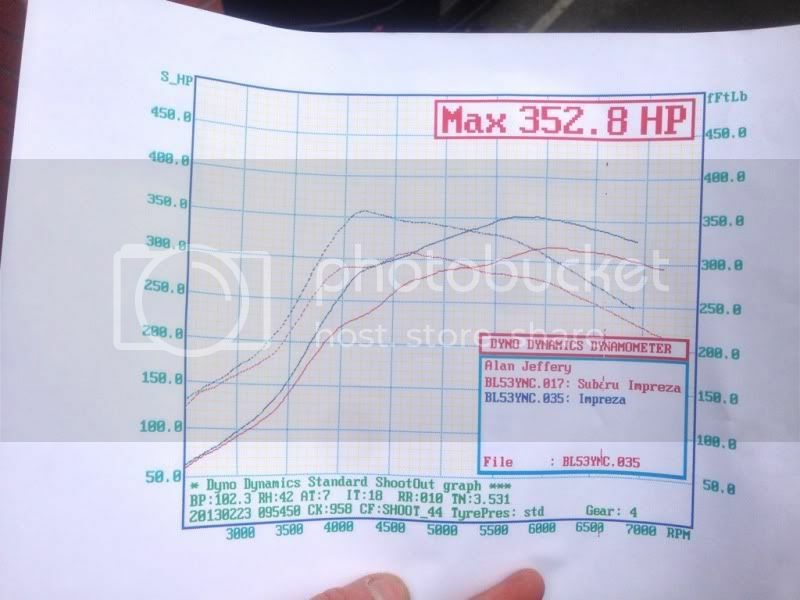 Nothing makes a day go better than a busy dyno and happy customers..